.., you will find yourself at the end of a cul-de-sac called Royon Drive, facing this footbridge over the Stockport - Altrincham railway. Quite an obstacle for a National Cycle Network route. The steps on the other side of the bridge are equally difficult, if not worse. 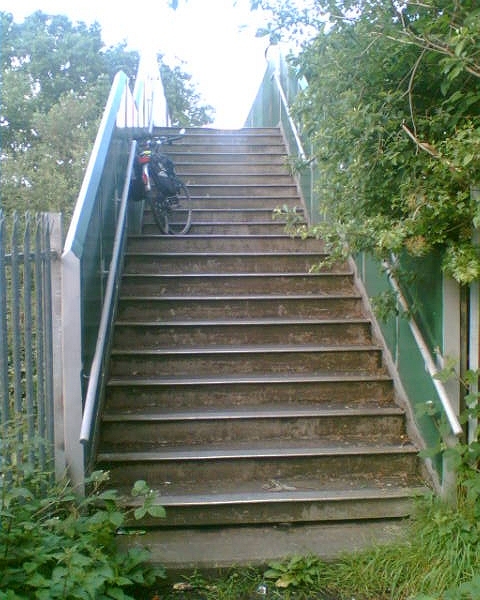 We have been told that the Stockport Cycling Officer had been negotiating with Network Rail about the possibility of a 'cycle gutter' to make it possible to push a bike up the steps rather than carry it, but even so it would be quite a push. This map is an extract from the CycleGM interactive cycle map: the three dots in the middle (euphemistically keyed as 'walk your bike') mark the location of the bridge. 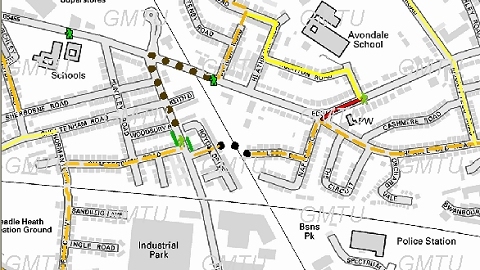 The brown blobs on the map show a designated walking route for those who don't fancy the bridge, walking because the hypothetical user does not have the confidence to negotiate the roundabout by the Morrison's and Homebase superstores. Is there a solution? There's no room to rebuild the bridge at its current location, but perhaps a new route alongside the railway and a new bridge connecting to Keith Drive - obviously too costly in current conditions. The roundabout is only a problem when travelling towards the airport as a simple left turn is all that's needed. Travelling towards Stockport ... it's every cyclist for him/herself, I'm afraid, but that footbridge as it stands is best avoided. 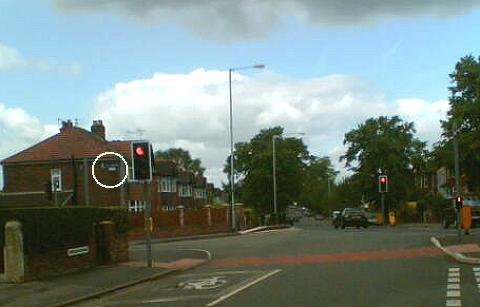 In my view, the sign in the top picture should be removed, and cyclists heading away from Stockport routed along the main road and left at the roundabout. What a shame it is that nothing was done when the planners permitted the superstore development. Written by Charlie Hulme, May 2011.